Here you can find valuable information regarding our organization, including meeting times, events & continuing education classes. Our Mission is to provide an opportunity for networking between adjusters, agents and vendors within the claims industry. Our Monthly meeting provides a forum where insurance representatives gather each month for professional development, networking and community involvement. If you are a part of the insurance community, no matter a seasoned veteran or new to the industry, we welcome your interest and membership, and look forward to seeing you at a future meeting. Our monthly meeting is held on the first Tuesday of every month. (except July & August) from 6:00 p.m. to 8:00 p.m. Please click here and sign up to our monthly newsletter to receive updated information. The Mobile Claims Association will be hosting its 4th Annual Bowling event. Our goal is to provide our members (specially our non-golfers) an opportunity to network through a fun social event. We look forward to seeing many of you and to making this a successful bowling night. For more information please contact any of our officers. 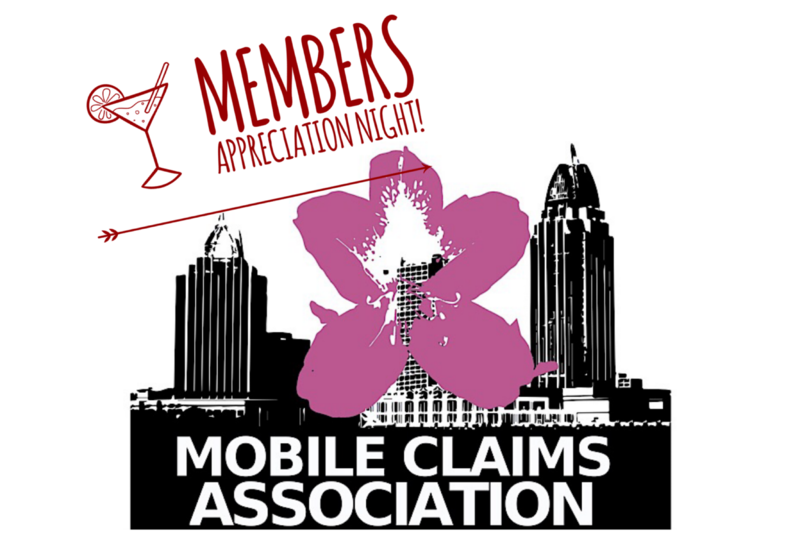 The Mobile Claims Association meetings are held on the first Tuesday of each month. We have also planned a variety of fun networking events throughout the year. Please stay tuned for details on locations. Visit this page to browse our membership list. It's an essy way to find the person or claims resource your looking for. Sign-up for our newletter to stay informed about what is happening with MCA events and meetings. Check out our picture galleries from past MCA events. Visit our Events Calendar to see a schedule of upcoming events (e.g. CE classes).